OK readers, here is a genuine rarity for your enjoyment today. 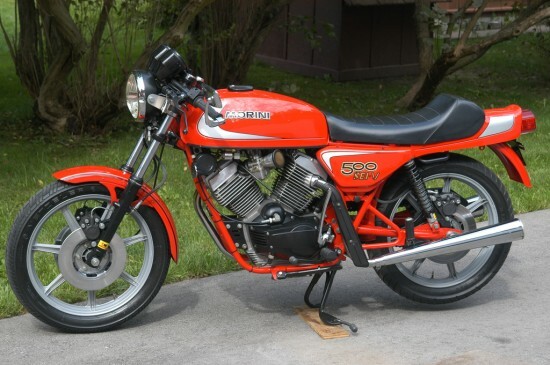 In the last post on CSBFS as well as this post on RSBFS, we introduced you to the gem known as the Moto Morini 3 1/2. The little 350cc vee twin is well known for its handling, but also known to be down on power. 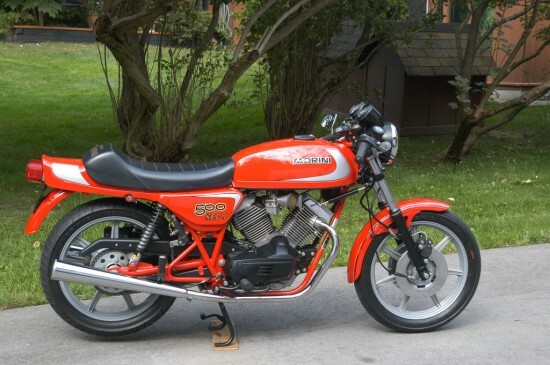 Since there is no substitute for cubic inches, Moto Morini released a larger version of the bike, known as the 500 Sport. This example is about as pristine as you will hope to find, should you be lucky enough to find one of these rare models at all. With a beefier frame and larger displacement, the 500 Sport was a physically larger – as well as faster – motorcycle than the diminutive 3 1/2 Sport. Will 11 or so ponies on the standard edition smaller bike, the 500 was good for approximately 46 HP. 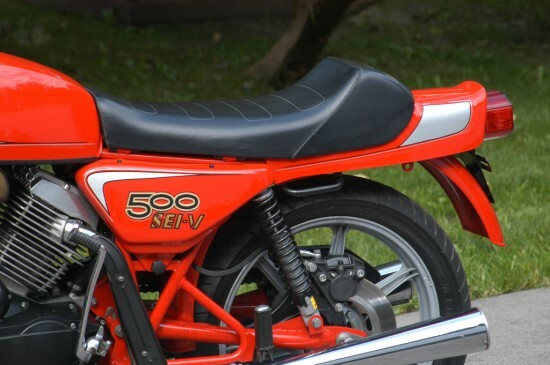 The 72 degree vee twin was connected to the six speed transmission by way of a dry clutch arrangement – and offers up a dry clutch rattle similar to Ducatis. There is no bespoke oil pump to pressurize the upper rocker boxes. That duty is left to crankcase pressure venting oil mist up the pushrod tubes. Thus, Moto Morini riders will do themselves well to let these bikes warm up before riding them in anger. On the chassis side, rear suspension was Ceriani while the front forks were supplied by Marzocchi. Braking duties were handled by a trio of Grimeca discs. A steering damper is standard equipment. 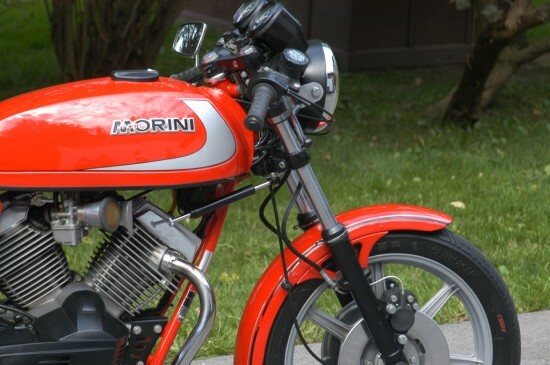 Overall, the Moto Morini brand was known for using high-end equipment on their bikes, which resulted in a high price point. The final stage of the early Moto Morini twins’ evolution, the 500 Sport is a handsome and affordable – and very unique – Italian classic. With its Heron cylinder heads, dry clutch and six-speed box and top-drawer Italian components, these are exotic yet reliable machines. This example shows very little evidence of its low 6,854 miles and has spent the better part of its life on display in a climate-controlled environment. Check out the hi-resolution pics HERE and you’ll see just how well-preserved this machine is. There is unfortunately some staining on the left side lower frame and swing arm from a battery acid overflow and a couple of small chips (visible in the hi-res photos) from normal use. Otherwise, mint. It seems to be a given that as soon as we find a rare and unique bike on either RSBFS or CSBFS we immediately find one or two more just like it. Since good things happen in threes, here is the third Moto Morini found inside the space of a week or so. That is great news for the collector, however – as Moto Morinis do not come around often. This beauty – by far the best example I have seen in a long time – is available on eBay right now. The seller has provided some good information, as well as a link to some gorgeous high-resolution pictures. If you are at all interested in the brand, I recommend you check them out. As for the bike, the auction has not yet crossed the $4k mark, and the reserve is still in place. Expect this to go to over $5k before the action heats up; bikes in this condition do not appear with great frequency.